Anne Marbury was born in Alford, Lincolnshire, the eldest daughter of a strong-willed Anglican priest who had been imprisoned and removed from office because of his demand for a better-educated clergy. In 1605 the family moved to London, where her father was reinstated to the clergy. He died in 1611, leaving his daughter a legacy of biblical scholarship and religious independence. The following year Anne returned to her birthplace as the bride of William Hutchinson, a prosperous cloth merchant. For the next 20 years she operated the household, acquired a knowledge of medicinal herbs, and cared for over a dozen children. Hutchinson also continued her father's religious individualism. Adopting Puritanism, she often journeyed to St. Botolph's Church in Boston, England, to hear John Cotton, one of England's outstanding Puritan ministers. When the Anglican Church silenced him and he left for the colony of Massachusetts in America, Hutchinson became extremely distraught. She finally persuaded her husband to leave for America, so that she could follow her religious mentor. The Hutchinson family was well received in Massachusetts. William Hutchinson was granted a desirable house lot in Boston, and both husband and wife quickly became church members. William Hutchinson resumed his career as a merchant, became a landowner, and was elected a town selectman and deputy to the General Court. Hutchinson's experience with medicinal herbs made her much in demand as a nurse, and she made many friends. When she was criticized for failing to attend weekly prayer meetings in the homes of parishioners, she responded by holding meetings in her own home. She began by reiterating and explaining the sermons of John Cotton but later added some of her own interpretations, a practice that was to be her undoing. John Cotton was an intelligent and subtle theologian who had articulated an extremely fine balance between the value of God's grace and the value of good works in achieving salvation. While the Puritans believed that salvation was the result of God's grace, freely given to man, they also maintained that good works, or living the moral life, were important signs of that salvation and necessary preparation for the realization that one had received God's grace. But grace and works had to be kept in proper balance. To overemphasize works was to argue that man could be responsible for his own salvation and thus would deny God's power over man. On the other hand, to overemphasize grace was to assert a religious individualism that denied the necessity of moral living and by implication rejected clerical leadership, church discipline, and civil authority. While Cotton had maintained his balance in this most difficult of issues, Hutchinson did not, and she finally came to stress grace to the exclusion of works in determining salvation. The origin of her views is difficult to discover. Certainly Cotton had influenced her. She probably held her beliefs prior to her arrival in Boston, but she evidently did not advance them until the meetings in her home. As her meetings became more popular, Hutchinson drew some of Boston's most influential citizens to her home. Many of these were town merchants and artisans who had been severely criticized for profiteering in prices and wages; they saw in Hutchinson's stress on grace a greater freedom regarding morality and therefore more certainty of their own salvation. But others came in search of a more meaningful and personal relationship with their God. 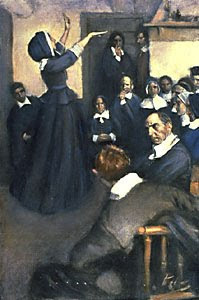 As she attracted followers and defenders, the orthodox Puritans organized to oppose her doctrines and her advocates. The issue of grace as opposed to works assumed political significance and ultimately divided Massachusetts into hostile camps. The orthodox Puritans called the Hutchinson group "Antinomians," or those who denied the applicability of moral law to the saved, and the Hutchinsonians referred to orthodox Puritans as "Legalists," or those who trusted only the observance of church laws as a sign of salvation. The orthodox Puritans, always a majority in the colony, came to demand repudiation of what seemed not only religious error but also potential social chaos. If Hutchinson's views predominated, they reasoned, individual conscience would replace clerical and civil authority as the standard for public conduct. 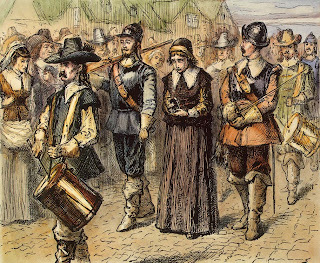 The Puritan orthodoxy began its assault on the dissenters in the May 1637 election. Henry Vane, a Hutchinson defender, was defeated for reelection to the governorship by John Winthrop, an opponent of her views. In the summer a synod was called in order that the "errors" of the Hutchinsonians could be identified and dealt with by the government. Following a special election in October, in which the orthodoxy increased its political strength, the government moved against individuals. 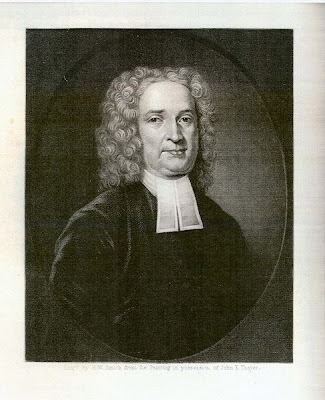 Boston's pro-Hutchinson deputies were not permitted to take their seats in the General Court, and Hutchinson's brother-in-law John Wheelwright (previously convicted for sedition and contempt because of a sermon preached in defense of grace) was banished. The court then moved against Hutchinson. It was a difficult situation. As a woman, her words had not been public and she had not participated in the political maneuvers surrounding the controversy. Called before the court, she was accused of sedition and questioned extensively. She defended herself well, however, demonstrating both biblical knowledge and debating skill. She returned the next morning to be aided by John Cotton's testimony about her beliefs, which differed from the report of the clergymen who had spoken for the court. This conflicting evidence would have cleared her, but she brashly intervened and, before it was over, had declared herself the recipient of direct revelations from God, without aid of either Scripture or clergy. This assertion of direct communion with God was regarded as the vilest heresy by all, and it sealed her doom. She was banished as a woman "not fit for [Massachusetts] society." While Hutchinson's trial was, by modern standards, a gross miscarriage of justice, it was not unjust according to the standards of 17th-century England, where, generally, in sedition cases a formal defense was not permitted and a jury was not used. Yet even by 17th-century standards, a mistrial occurred when the same men sat both as prosecution and judge, for her guilt had been thus "known" by the General Court long before she even presented herself to it. After her sentencing, Hutchinson's importance waned. Her strongest supporters had either left Massachusetts or been banished, and her idol, John Cotton, had finally allied himself with the orthodoxy. The result of her investigation by the Boston congregation was a foregone conclusion. Her attempt to renounce her former errors was taken as incomplete by the clergy, and she was excommunicated for the sin of lying. Within a week she and her family departed for Rhode Island, where she was free to practice her religious views. In 1642 her husband died, and Hutchinson moved with her six youngest children to Long Island and then to the New Netherland (New York) mainland. In the late summer of 1643, Hutchinson and all but one of her children were killed in an Indian attack. It was a sad end for an important religious figure. Hutchinson's emphasis on grace as the only requirement for salvation was an important step toward the achievement of religious freedom--that is, the ability to follow the dictates of one's own conscience in matters of belief--in America. This is a list of beliefs for which Anne Hutchinson was prosecuted, and was transcribed from: The Heresies of Anne Hutchinson and Her Followers, by Rev. Thomas Welde of the fisrt church of Roxbury, Massachusetts; The Preface to "A Short Story of the Rise, Reign, and Ruin of Antimonians." (1644). That the Law and the preaching of it, is of no use at all to drive a man to Christ. That a man is united to Christ and justified, without faith; yea, from eternity. That faith is not a receiving of Christ, but a man's discerning that he hath received him already. That a man is united to Christ only by the work of the Spirit upon him, without any act of his. That a man is never effectually Christ's, till he hath assurance. This assurance is only from the witness of the Spirit. This witness of the Spirit is merely immediate, without any respect to the word, or any concurrence with it. When a man hath once this witness he never doubts more. To question my assurance, though I fall into murder or adultery, proves that I never had true assurance. Sanctification can be no evidence of a man's good estate. No comfort can be had from any conditional promise. Poverty in spirit (to which Christ pronounced blessedness, Matt. v. 3) is only this, to see I have no grace at all. To see I have no grace in me, will give me comfort; but to take comfort from sight of grace, is legal. An hypocrite may have Adam's graces that he had in innocence. The graces of Saints and hypocrites differ not. All graces are in Christ, as in the subject, and none in us, that Christ believes, Christ loves, etc. Christ is the new Creature. God loves a man never the better for any holiness in him, and never the less, be he never so unholy. Sin in a child of God must never trouble him. Trouble in conscience for sins of Commission, or for neglect of duties, shows a man to be under a covenant of works. All covenants to God expressed in works are legal works. A Christian is not bound to the Law as a rule of his conversation. A Christian is not bound to pray except the Spirit moves him. A minister that hath not this new light is not able to edify others: that have it. The whole letter of the Scripture is a covenant of works. No Christian must be pressed to duties of holiness. No Christian must be exhorted to faith, love, and prayer, etc., except we know he hath the Spirit. A man may have all graces, and yet want Christ. All a believer's activity is only to act sin. You always feature such interesting women Mirella and I am impressed with the time you must spend doing research for these posts. It never fails to shock me how religion causes discord and problems. The Puritan government of the Massachusetts colony provides such a clear example of the importance of separating Church and State. 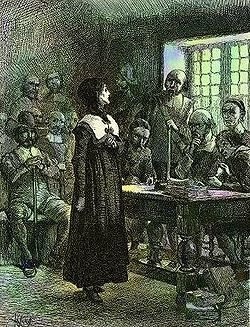 I have always greatly admired Anne Hutchinson. She was an early settler in my state, after leaving Massachusetts. You should feature her friend, Quaker martyr Mary Dyer, as well. They are both examples of strong women who helped create America.